Based in Kansas City, MO, ARO, Inc., utilizes an at-home workforce based inside the United States as it offers business process outsourcing (BPO) for companies in industries such as insurance, healthcare, pharmaceutical, and energy. ARO hires only employees, not independent contractors. ARO offers both full- and part-time employees set schedules. Call center agents - Some positions are customer service only, e.g., medical history interviewers who take both inbound and outbound calls from applicants. 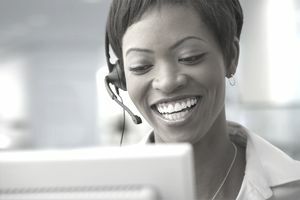 These jobs require customer service skills, good listening and ability to document conversations using computer applications. Knowledge of medical terminology is a plus. Other call center jobs are for inbound and outbound sales. Experience in sales and a minimum commitment of 25 hours per week is required in these jobs. Premium insurance auditor - Company hires both phone auditors and physical auditors. Phone auditors only use the phone and the computer to conduct premium audits for property and casualty insurance, i.e., general liability and workman's compensation. Physical auditors do the same but must do a final physical walk-through at the company being audited. Licensed insurance agents - Company has work-at-home jobs for both life insurance and property and casualty agents making both inbound and outbound calls. Telehealth - Company hires nurses, both RNs and LPNs, for inbound and outbound calling positions. While ARO hires in all U.S. states, it is not always hiring in every state. Applicants must have a dedicated workspace with a door. No noise background noise from pets, children or other sources is tolerated. Also, the agent must supply a computer, a high-speed Internet (cable or DSL), a dedicated phone line with no call waiting for features (VoIP services may be acceptable), and a basic telephone with amplifier and headset. Cordless and cell phones are not acceptable. To apply for any of these positions, go to ARO's website and click "Apply to Be a Remote Employee Today!" Fill out the contact information, choose which type of job for which you are applying and upload your resume. You should then receive a confirmation email. If the company is hiring in your area and you meet the requirements, you may receive another email inviting you to complete a full application and to interview by phone. Training varies based on the position and can be done remotely or at a corporate location. Training is paid at the same as the regular hourly rate and lasts 6 to 10 weeks for 3 to 8 hours per day. For telecommuting jobs in a variety of fields, a directory of work-at home-companies will be helpful. For more profiles like this, check out more work-at-home call center company profiles.